!! Christopher Walken is watching you pee !! It would be funnier to take photos of people reacting to it, but I think cameras in an occupied mensroom are generally frowned upon. 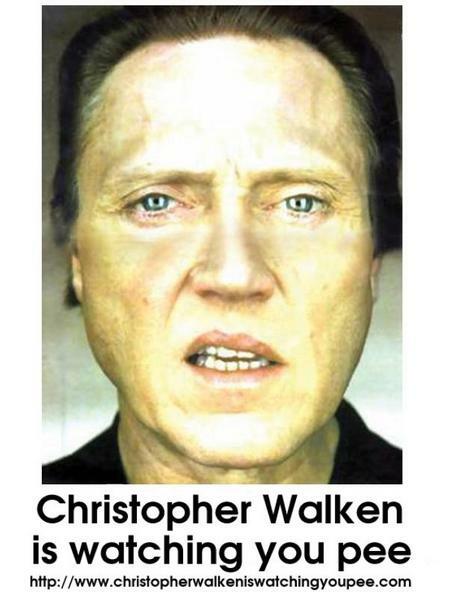 4 Comments on "Christopher Walken is watching you pee"
This is one of the stupidest things I have ever seen. It’s really remarkable what people think is funny. How dumb. That’s awesome! Printing some up now … thanks! This is up in the men’s room at my office! There is NO way I could make anything come out of me with that staring in my face.